I believe in the importance of a daughter developing a special relationship with her dad. 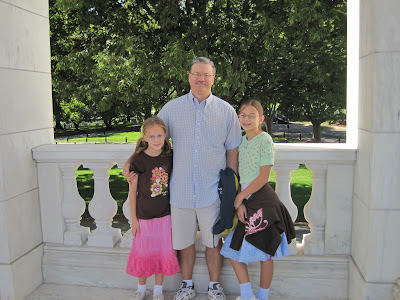 I have benefited immensely from being close to my father, and am excited to see my husband and our girls spending time together. They enjoy accompanying him on trips to Lowes and the county dump(! ), but as they’ve gotten older, we’ve realized the importance of them having one-on-one time with him. I know many families have regular daddy-daughter dates, and that’s what we began planning some months ago. As with most things in our lives, we knew they wouldn’t happen if we didn’t schedule them. Since weeknights and Saturdays tend to fill up with other activities, we decided that Sundays after the evening church service would be a convenient time. Most of the time it’s something simple – a milkshake from the Arby’s value menu, a doughnut at Dunkin’ Donuts, or a Wendy’s Frosty. Occasionally they’ll do something a little more extravagant, or even substitute a Saturday morning breakfast out, but the point is not how much money it costs – or even the food that’s eaten – but the time spent together. While the immediate benefits include keeping those lines of communication open, I also know that when our girls get older, they will look back on these dates as treasured memories. I love when dads make a point of spending one on one time with their girls. It's so important I think. This is something my husband has started doing with our girls. For Christmas he made them certificates for a date and they could pick what they wanted to do. He's made an effort to do this regularly with the girls since then. Recently he picked our oldest daughter up from school and took her to a nearby coffee shop for an after school snack. I think it is so valuable for them to get this one on one time together. It's something I have to make an effort to do as well as the mom. I'm usually with both of them all the time. I have to be intentional about outings with them individually. My daughters adore my husband, so I'm sure they would love spending time with him, especially Rachel who is two. She usually gets left when he takes the older ones somewhere. I'll have to suggest this to him. Love this! We did this for a while with our girls, but need to get back to it. I like your idea of Sunday nights. I am going to suggest this to my husband so he can get them out again for that one-on-one time.